If you haven’t picked up on it yet, don’t worry: It’s new. I’m trying to incorporate regular features into my blog every week. Anyway, this week was kind of strange one. SALT (youth group student council) concocted this crazy game that mixed perhaps five different games (dodgeball, basketball/soccer, line tag, the whole snitch concept from Harry Potter, and maybe one other? Regardless, it was chaos). The main thing, however, was that at some point during that meeting I mentioned squids? And then proceeded to think on how we could actually have squids. Which is when I started looking at squid projects online. 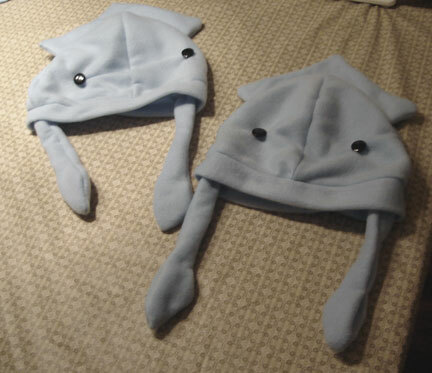 Amazing, really, that when you type “free squid hat pattern” into Google, you get more hits than you probably should. People love their cephalopods (squids, octopi, and the like). It seemed easy enough, so I went to Walmart and bought the cheapest fleece I could find that seemed to be a squid color (I chose light blue). Some of it was in the remnant bin. With about a yard and a half of fleece (I think it was 60-in width), I managed to make four hats and have some left over. I picked up some flat-faced, shiny round buttons and some coordinating thread. Cost: $4 for fabric + $2 for thread + $1.50 for buttons = ~$7.50 total. 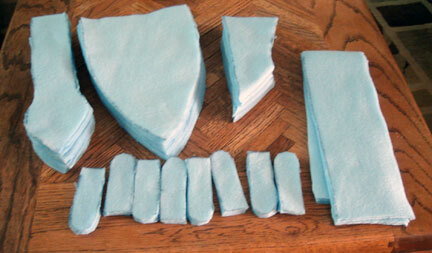 Everything was pretty straightforward, though the hats came out a bit smaller than they were supposed to be. I didn’t realize until a few pages deep in the pattern that the grey border around the pattern pieces was supposed to be the seam allowance. The trickiest part was getting the machine to go over the thicker parts of the hat while sewing on the brim and fin pieces. Other than that, smooth sailing. I didn’t have a chance to put together the smaller tentacles as I had hoped, due to the fact I ran out of time before youth group, but they still look like squids to me, and I figure that’s really the level of success I was going for anyhow.